This timeline is intended to credit all those who played their part in the development of television, whether it be mechanical television (as first demonstrated by Baird) or the modern day electronic television developed by many others. I have attempted to quote in each section - establishable facts that are backed up by professional institutions and research and where more than one source for the information exists. 1817 – The Swedish scientist Jöns Jakob Berzelius discovered the existence of selenium. Berzelius and his colleague Johann Gottlieb Gahn were studying a method of producing sulphuric acid in lead cameras when they observed residues of a substance with a very intense scent in the bottom of the camera. At first, they thought it was Tellurium. However, a more careful analysis revealed that there were no residues of this element, in spite of its identical properties. To this new substance was given the name Selenium, a term that derives from the Greek Selènè (Moon). Since Klaproth had named Tellurium for the Earth, Berzelius thought it appropriate to name the sister element for the Earth's satellite. 1839 – Alexandre Edmond Becquerel discovered the electrochemical effects of light. Electricity, magnetism, and light were the main subjects of his work. At the time, these subjects were "hot" topics. Hans Christian Orsted had made his discovery that an electric current had an effect on a magnet in the year Becquerel was born. Michael Faraday had just (in 1831) discovered the effect of induction, and Louis Daguerre invented the photographic plate in 1837, the year before Becquerel began his scientific work. Becquerel set out to study the chemical effect of light, and in 1839 he discovered a remarkable effect: electricity was emitted following the chemical actions due to the light-the photoelectric effect. A study was begun, in 1839, with Jean-Baptiste Biot to study the phenomenon that certain substances emit light after having been exposed to light. Becquerel devised an ingenious apparatus. The main idea was to have two discs with holes in them rotating about an axis parallel to the beam of light illuminating the sample placed between the discs. The sample receives light only when a hole passes in front of it; otherwise, the disc blocks the path of light. Likewise, the emitted light is observed only when a hole in the other disc passes the sample and can be examined at varying times after the exposure by changing either the relative positions of the holes or by changing the speed of rotation. 1869 – French artist Albert Robida, a contemporary of Jules Verne, published a series of pictures. One shows a man, reclining in an armchair in the comfort of his own home, whilst watching a 'televised' performance of Faust. 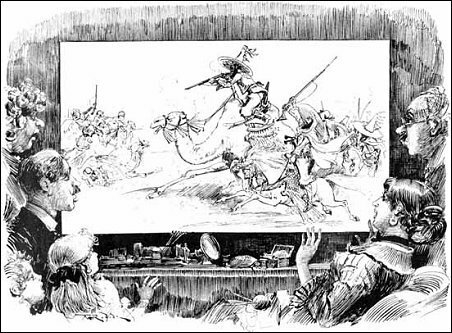 1875 – The earliest system that bore any resemblance to television in a broadcast sense was outlined by George R. Carey of Boston, Mass. His suggestion was based on the functioning of the human eye. Carey, born in 1851, was a professional surveyor employed by the City of Boston but he was also something of an inventor. He was among the first to propose the telectroscope using the photoelectric properties of selenium as a means for transmitting images. He did further research into May's 1873 discovery and used it to devise a crude system for transmitting images. In the May 17th, 1878 issue of 'Scientific American,' the editors alluded to their earlier article about the 'telectroscope invented by M. Senlecq of Ardres.' This was followed by the news that they had before them 'some very ingenious and curious applications of selenium, in which its peculiar property of changing its electrical conductivity when exposed to light varying in intensity is utilized. The several devices are the invention of Mr. George R. Carey, of Boston, Mass.' A more detailed article was published in the June 5th, 1880, 'Scientific American.' The article described two different inventions. The first used an array of selenium photocells and wires to transmit an image to an array of light, which were then used to expose a piece of photographic paper. The photograph could then be developed to create a single image. The second invention used a large array of photocells and wires to transmit the signal to a visual display made of many individual lights. The report stated that "although this approach should work in theory, each individual pixel requires its own photocell and wired circuit, making this system cumbersome and expensive for producing even a modest size image." 1878 - Sir William Crookes investigated the properties of cathode rays, showing that they travel in straight lines, cause phosphorescence in objects upon which they impinge, and by their impact produce great heat. 1879 - George du Maurier drew a cartoon for 'Punch' which showed a mother and father watching, on the wall of their home in England, a tennis match which their daughter is playing in Ceylon. They were also able to speak to her by long-distance telephone. 1881 – Shelford Bidwell demonstrated an apparatus for transmitting silhouettes but it was soon realised that the control of a current by light was not enough and a way of dividing a picture into elements was required. Shelford Bidwell an English physicist and inventor was best known for his work with "telephotography", a precursor to the modern fax machine. In the late 1870s, Bidwell carried out a number of experiments with selenium photocells. In one experiment, Bidwell placed a selenium photocell inside a rotating cylinder. A small hole in the cylinder allowed the photocell to scan an image on a brightly illuminated glass slide. Another rotating cylinder was covered with a paper treated with potassium iodide. The electrical signal from the photosignal was sent to a platinum wire that darkened the paper when current was applied. Bidwell's device did not solve the problem of synchronizing the transmitter and receiver. Both cylinders were on the same shaft. Similar devices for transmitting images had previously been demonstrated Alexander Bain (who invented the electric clock, the electric printing telegraph, and the first fax machine) and Frederick Bakewell, but Bidwell was the first to use a photocell to scan the image. Bidwell reported his results in an article entitled "Tele-Photography" in the February 10th, 1881 issue of 'Nature.' His device is displayed in the London Science Museum. 1882 – William Lucas (in a letter to ‘The Mechanic’) made the first significant proposal for a television scanning system. He accurately described the horizontal and vertical scanning utilised by modern television, but never constructed a successful apparatus. 1884 – Paul Nipkov first conceived the idea of a scanning disc spirally perforated and rotating which made use of the selenium cell. However, he could not amplify the impulses. While still a student, Nipkow invented the Nipkow disk. Accounts of its invention state that he conceived the idea of using a spiral-perforated disk to divide a picture into a mosaic of points and lines while sitting alone at home with an oil lamp on Christmas Eve, 1883. Clearly Nipkow got this idea from the earlier work of Alexander Bain and Shelford Bidwell but the Nipkow disk improved the encoding process. He applied to the imperial patent office in Berlin for a patent covering an electric telescope for the electric reproduction of illuminating objects, in the category "electric apparatuses". This was granted on 15th January 1885, retroactive to 6th January 1884. It is not known whether Nipkow ever attempted a practical realization of this disk but one may assume that he himself never constructed one. The patent lapsed after 15 years owing to lack of interest and Nipkow went to work as a designer at an institute in Berlin-Buchloh and did not continue work on the broadcasting of pictures. The device itself is nothing more than a mechanically spinning disk of any suitable material (metal, plastic, cardboard, etc. ), with a series of equally distanced circular holes of equal diameter drilled in it. These holes are positioned to form a single-turn spiral starting from an external radial point of the disk and proceeding to the centre of the disk, much like a gramophone record. The holes, when the disk rotates, trace circular ring surfaces, with inner and outer diameter depending on each hole's position on the disk and thickness equal to each hole's diameter. A lens projects an image of the scene in front of it directly onto the disk. Each hole in the spiral takes a horizontal "slice" through the image which is picked up as a pattern of light and dark by a sensor. If a light powered by a signal from the sensor is placed behind a second Nipkow disk rotating in synch at the same speed and direction, the image can be reproduced line-by-line, however it remains no larger than the one projected onto the original receiving disk. The scanlines are not straight lines, but rather curves. So the ideal Nipkow disk should have either a very large diameter, which means smaller curvature, or a very narrow angular opening of its viewport. 1889 – Jean Lazare Weiller tried image scanning by a system of revolving mirrors; a mirror drum throwing light reflections on to a selenium cell but he, too, lacked the means of amplification. Weiller was an industrialist and French politician born in Sélestat (The Low-Rhine) in 1889. A presentation in a communication at the Academy of Science and in an article “On the Remote Vision by Electricity” published in 'Civil Engineering' (October 12th, 1889) described an apparatus which introduced the 'Phorosphore”', which makes it possible to analyze mechanically and to remotely reconstitute an image of 10 centimetres. The apparatus, which wasn't constructed until 1898, was composed of a bearing drum on the side of tens of small polished metal plates forming mirrors, inclined according to variable angles' so as to reflect on a photosensitive cell on selenium the various parts of the image. The reception, an identical apparatus, synchronized on the transmitter, made it possible to reconstitute the image. An image of 10 cm X 10 cm was cut out in 250.000 elements. Five years after the definition of the disc of the German Paul Nipkow, Weiller presents an alternative method, more expensive but finer, described in Large encyclopaedic Larousse under the name of “Wheel of Lazare Weiller”. This process will be used in the first developments of mechanical television (1905-1932) and will be incorporated by John Logie Baird in the system implemented by the BBC in 1932 for its first regular services. 1897 – The first cathode-ray tube for commercial use was introduced by Karl Braun (1850 – 1918) a German inventor and physicist of the University of Strasbourg. CRT technology is to this day used by most television sets and computer monitors. The tube is an evacuated glass envelope containing an electron gun (a source of electrons) and a fluorescent screen, usually with internal or external means to accelerate and deflect the electrons. When electrons strike the fluorescent screen, light is emitted. 1904 – 16th November - Dr. John Ambrose Fleming patented the two-diode thermionic valve, a device used to amplify, switch, otherwise modify, or create an electrical signal by controlling the movement of electrons in a low-pressure space. The Supreme Court later invalidated the patent because of an improper disclaimer and, additionally, maintained the technology in the patent was known art when filed. This invention is often considered to have been the beginning of electronics, for this was the first vacuum tube. 1906 - Max Dieckmann and Gustav Glage were the first to produce 'raster images' on a cathode-ray tube; they patented their techniques in Germany in 1906. A Raster scan, or raster scanning, is the pattern of image detection and reconstruction in television, and is the pattern of image storage and transmission used in most computer image systems. In a raster scan, an image is cut up into successive samples called pixels, or picture elements, along scan lines. Each scan line can be transmitted as it is read from the detector, as in television systems, or can be stored as a row of pixel values in an array in a computer system. On a television receiver or computer monitor, the scan line is turned back to a line across an image, in the same order. After each scan line, the position of the scan line is advanced, typically downward across the image in a process known as vertical scanning, and a next scan line is detected, transmitted, stored, retrieved, or displayed. 1907 – In St. Petersburg (now Leningrad) the Russian Boris Rosing conceived the idea of an ‘electronic vision’ system using cathode-ray tubes in conjunction with mirror drums. He also could not find a means of amplification. Boris Lvovich Rosing envisioned a TV system using the CRT on the receiving side. Rosing filed a patent application in Germany on November 26th, 1907 and on the improved version of his system on March 2nd, 1911. He followed up with a demonstration of which a report was published in the Scientific American with diagrams and full description of the invention's operation. Rosing's invention built on the work of Paul Nipkow and his spinning discs, and although it used a CRT, its operation was electromechanical instead of purely electronic. Accordingly, Rosing's system employed a mechanical camera device, and a very early cathode ray tube as a receiver. The system was primitive, but it was definitely one of the first experimental demonstrations where the cathode ray tube was employed for the purposes of television. Rosing continued his television research until 1931 when he was exiled to Arkhangelsk by Joseph Stalin. Rosing died in exile in 1933. 1908 – In the June 4th issue of 'Nature,' article "Telegraphic Photography and Electric Vision", Shelford Bidwell reported on "telegraphic photography" experiments by other scientists and commented on the greater difficulties faced by those wishing to develop "distant electric vision". He pointed out that besides the problem of synchronizing the transmitter and receiver; there was a much larger problem in transmitting the extremely large volume of data at a rate that would create a continuous image to be viewed. He estimated that each image would need to have 16,000 to 150,000 "elements" (pixels in modern terminology) and a minimum scan rate of 10 times per second would be required. He suggested that this high rate of data transmission would require a separate circuit for each line scanned or possibly a separate circuit for each point in the image. This large number of circuits would result in a large, complex and expensive device. The article illustrated some of the problems in creating television and the possible solutions that were being considered in the first decade of the 20th century. 1908 – In response to Shelford Bidwell’s "Telegraphic Photography and Electric Vision" article Alan Archibald Campbell Swinton FRS, member of the Roentgen Society, the Wireless Society of London and the Radio Society of Great Britain, suggested that high-definition television was possible using cathode-ray tubes. The name of the article was "Distant Electric Vision". He wrote: "This part of the problem of obtaining distant electric vision can probably be solved by the employment of two beams of cathode rays (one at the transmitting and one at the receiving station) synchronously deflected by the varying fields of two electromagnets placed at right angles to one another and energised by two alternating electric currents of widely different frequencies, so that the moving extremities of the two beams are caused to sweep simultaneously over the whole of the required surface within the one-tenth of a second necessary to take advantage of visual persistence. Indeed, so far as the receiving apparatus is concerned, the moving cathode beam has only to be arranged to impinge on a suitably sensitive fluorescent screen, and given suitable variations in its intensity, to obtain the desired result." This article laid down the fundaments of modern television although at this time there were a number of aspects which made practical television impossible, prompting Bidwell to repeat his advice 20 years later in the June 1928 issue of 'Modern Wireless,' "Television by Cathode Rays". "Surely it would be better policy if those who can afford the time and money would abandon mechanical devices and expend their labours in what appears likely to prove the ultimately more promising method in which the only moving parts are imponderable electrons." 1918-19 – John Logie Baird decides to build an apparatus based on Paul Nipkow’s disc scanning theory. Mr Colin Graham of Ibrox, Glasgow who worked for Baird said that Baird rented an attic in Bath Hotel, Bath Street, between 1918 – 1919, where Graham helped him punch holes in cardboard discs, which he later recognised as Nipkow discs for TV scanning. The widow of Alex Horn, a civil engineer friend of Baird’s recalled that her husband spent a great deal of his spare time manufacturing ‘secret’ components for Baird which appeared to be about half an inch by five-eighths of an inch, of either nickel or chrome. 1923 – Baird realised that despite the theoretical simplicity of the task, it had continually confounded many experimenters over the years as they tried to bring their designs to practical accomplishment. He found that the main difficulty lay in the light sensitive cell and therefore concentrated all his efforts on that part of the system. Baird had read reports of a sophisticated wireless set built by a schoolboy at Hastings Grammar School. One day, in February 1923, Baird turned up on the doorstep of Mr Mills’ family home in Hughenden Road. Called to the door by his mother, Victor Mills encountered Baird for the first time with the inventor telling him about his work on television. “What’s television?” enquired young Victor. “Seeing by wireless,” replied Baird. “You probably know something about resonance. I’m getting a picture but can’t do anything with it. I’m getting too much noise.” Mills soon became a frequent caller to Baird’s Queen’s Avenue address. “He had a collection of junk,” said Mills some years later. “I wouldn’t give you two pounds to sell the lot.” Mills claimed that he soon discovered the cause of Baird’s problem was that his selenium cells were too big. Mills also claims that on his second trip to Baird’s makeshift laboratory he took some of his own radio equipment with him. Whilst making adjustments, Mills put his hand in front of the illuminated apparatus. “I decided I’d got it right and just then Baird yelled out, “It’s here, it’s here!” And according to Mills the first pictures ever transmitted were of his hand.